I was hanging out amongst a pack of wild raccoons in Stanley Park on Saturday, in between a couple who was feeding them and a sign that said "DO NOT FEED THE ANIMALS." The sign further expounded that by filling the animals full of products such as bread, we are robbing them of all the nutrients they would otherwise ingest from the various plants and vegetation they eat naturally, thereby impairing their health. Something strange happened the next day. Following a week of eating about 700% more vegetables than usual, I suddenly found myself filled with boundless energy -- I woke up at 6am and read a book, made chicken and egg salad, built a bookshelf, cleaned out my closet, kitchen and bathroom, rearranged my furniture, did some sewing and played my trumpet. At 10pm I still hadn't felt the need for a nap, and went for a walk and was still filled with so much energy that I started jogging . . . right to the grocery store to buy more vegetables. It's like I've discovered natural speed. I know I can't eat salad everyday, but it's obviously something that needs to be a bigger part of my life, and maybe by keeping chopped vegetables on hand in the fridge, I can throw together a salad on those days when there is no time, rather than paying a visit to the pizza place. And so . 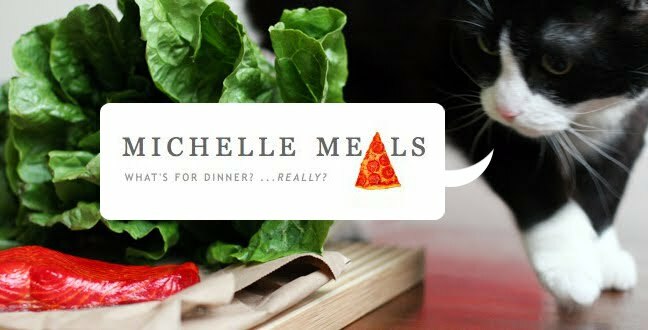 . . here's one from the early days of Michelle-Meals . . . the kale-avocado massage salad! Featuring sun-dried tomatoes, green onions and radishes, and accidentally too much white coral sea salt. I'm waiting for some sort of I-told-you-so to appear from Sonya in the comments... Long live pizza! Ha ha. I'm just happy that someone shares in my hallucination. ;) I no longer feel alone.